Growing Your Biz is proud to present a growing collection of job descriptions samples that are FREE for download and can be edited to suit the needs of your micro business. As you go about growing your business, you’ll inevitably reach a point where bringing others on board will be the necessary next step to take your operations to the next level. But hiring employees- whether on a full time, part time, or contractual basis- takes some work. If you want your employment efforts to be successful, then one of the most important elements to have in place is a well-written job description. To get you started on the right foot, here is a collection of free job description samples for some common positions among small and home-based businesses. Each of these job description examples has been thoroughly researched for accuracy and relevance. These documents are all in MS Word so you can customize them however you want. Keep in mind, that these sample job descriptions are meant to get you started in the right direction. It is up to you to do further research where needed and consult with a qualified professional to ensure that your job description is written in accordance with employment laws. Accountant (General) (15.5 KiB)– Job description for Accountant. Summary: Responsible for applying accounting principles and procedures to analyze financial information, prepare accurate and timely financial reports and statements and ensure appropriate accounting control procedures. App Developer (15.5 KiB)– Job Description for App Developer. Summary: Use programming languages, such as Java, C++ or ORACLE, and source code to create software that meets client requirements. Article Writer (12.5 KiB)– Job description for Article Writer. Summary: Responsible for generating high-quality written content for our business. Account Sales Representative (14.5 KiB)– Job description for Account Sales Representative. Summary: Generates revenue by developing market potential through forecasting, lead generation, qualification, and closing sales; recommending new products and services. Bookkeeper (18.0 KiB)– Job description for Bookkeeper. Summary: Responsible for recording financial transactions and creating financial reports, assisting in auditing and reconciling bank statements, clearing payroll accounts and maintaining payroll general ledger accounts, remitting taxes, levies and garnishments. Cashier (15.0 KiB)– Job description for Cashier. Summary: Process point of sale transactions including credit or debit card transactions and check validation, work the cash register, receive and disburse money from customers. Content Creator (15.0 KiB)– Job description for Content Creator. Summary: Write and produce various projects and blog regularly to expand our company’s digital footprint, awareness, subscribers, and leads. This role requires a high level of creativity, attention to detail, and project management skills. Content Manager (14.5 KiB)– Job description for Content Manager. Summary: Craft, write, and edit an array of projects, including blog posts, whitepapers, and newsletters. You will also create and implement a content marketing plan for our company. Content Moderator (12.5 KiB)– Job description for Content Moderator. Summary: Help to maintain the level of content quality and relevancy on our website. Copywriter (13.5 KiB)– Job description for Copy Writer. Summary: Responsible for creating high-quality web-based content for our website and online networks. 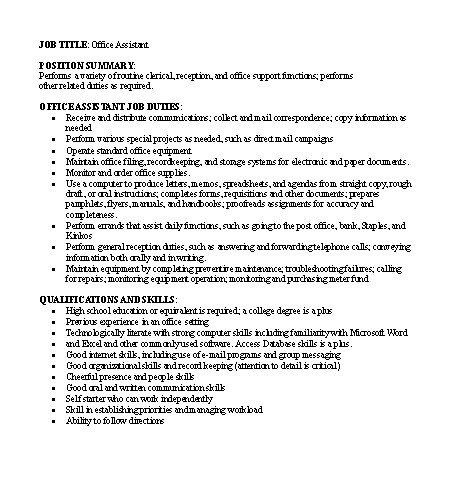 Copy Editor (14.5 KiB)– Job description for Copy Editor. Summary: Ensure that text is readable, accurate and ready for publication. Perform variety of editorial duties, such as laying out, indexing, and revising content of written materials, in preparation for final publication. Customer Service Representative (13.5 KiB)– Job description for Customer Service Representative. Summary: Serves customers by providing product and service information; resolves product and service problems, and documents actions. Data Entry Clerk (14.5 KiB)– Job description for Data Entry Clerk. Summary: Maintains database by entering new and updated customer and account information. Data Scientist (14.0 KiB)– Job description for Data Scientist. Summary: Determine key opportunties to create compelling content that will convert based on data analysis. Database Manager (16.0 KiB)– Job description for Database Manager. Summary: Coordinate changes to computer databases, test and implement the database applying knowledge of database management systems. May plan, coordinate, and implement security measures to safeguard computer databases. Information Security Specialist (18.0 KiB)– Job description for Information Security Specialist. Summary: Plan, implement, upgrade, or monitor security measures for the protection of computer networks and information. May ensure appropriate security controls are in place that will safeguard digital files and vital electronic infrastructure. May respond to computer security breaches and viruses. Information Technology Manager (15.0 KiB)– Job description for IT Manager. Summary: Plan, direct, and coordinate the development and operation of information systems and technology solutions for business needs. Java Developer (16.0 KiB)– Job description for Java Developer. Summary: Create and support Web-based Java applications, services, and interfaces. Office Assistant (15.0 KiB)– Job description for Administrative Assistant. Summary: Performs a variety of routine clerical, reception, and office support functions; performs other related duties as required. Retail Salesperson (17.5 KiB)– Job description for Retail Salesperson. Summary: Serves customers by helping them select products. SEO Manager (14.0 KiB)– Job description for SEO Manager. Summary: Be responsible for identifying and executing opportunities to improve our company’s and our content’s search rank for key terms. Social Media Manager (15.5 KiB)– Job description for Social Media Manager. Summary: Grow our social media following, engage and retain them, and help convert them into leads, customers, and active fans and promoters of our company. Telemarketing Sales Representative (13.0 KiB)– Job description for Telemarketing Sales Representative. Summary: In charge of calling, introducing and signing up clients to participate in new programs and promotions. Technical Writer (16.0 KiB)– Job description for Technical Writer. Summary: Interpreting technical information or applications and then designing and writing documentation about it in a clear, understandable way. UX Designer (14.5 KiB)– Job description for UX Designer. Summary: Work ranges from conceptualizing and forming product and website improvements and features to evaluating the usability and success of our marketing touchpoints. Video Specialist (14.0 KiB)– Job description for Video Specialist. Summary: Serve as the photographer and video editor who captures, edits, and produces photos and videos for both internal and external purposes. Web Developer (14.0 KiB)– Job description for Web Developer. Summary: Works on a company’s website and other projects as needed with an eye for design along with practical web development abilities. Great! This job descriptions can assist us to create a job application which can attract the job candidates who are qualified for the job.